I have been thinking about the creative process a lot lately. What inspires me to create, what informs my decisions, and how exploration is essential to making it all work out. Do you ever feel like you know something, but if you were asked to explain it, you would be at a loss for words? This is how I am in regard to finding the words to express all I think about when I am in the middle of the creative process. This is a big question, so I will keep noodling on it. If you have any thoughts please share them with me, as they will probably help. With this painting, I think the creative process informed almost every decision because it was painted on a dark and gray day, so I had to consciously make several decisions to amplify color and value contrast in order to create the play of light and pattern as I wanted. A lot of the time when painting from life, this may not be the case because the quality of light is so nice… instead with this painting, I had an idea and I had to keep it in mind all the time so I would not lose it. I began this series as a way to celebrate life and to further explore and capture the wonderful and heartfelt. With this painting I wanted to experiment with a bird's eye view to maximize the visual diversity found in the two types of mums. It also allowed me to incorporate the embroidered detail of a linen handkerchief that had recently been given to me by a dear friend. An added benefit of this painting is that it now also celebrates the wonders of friendship. With this series, each new composition presents an opportunity to investigate new ways to convey the beauty and textural diversity found in flowers. 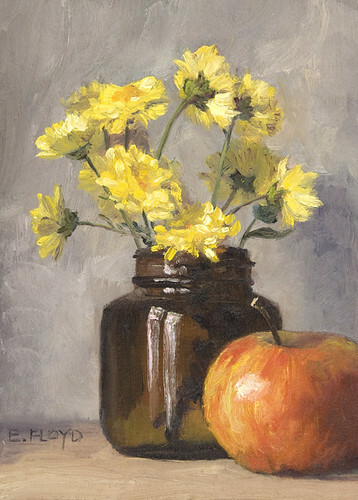 In this painting I wanted to share the impression of a mass of flowers and stems surrounded by shiny apples, so instead of depicting the mums individually, I focused on the mass of yellow and how the flowers in shadow edged to violet. Everything just seemed to fall into place, impressions captured and conveyed. It was a joy to paint. This is the second painting of my Bountiful Observations series. One of the reasons I like painting still lifes is that it requires me to slow down and really observe an object or objects. Through this concentrated effort of learning how something really is, I learn that things are not always as I think. Close observation forces me to think about the objects before me and to leave my pre-conceptions behind. With this painting, this is what I needed to do in order to capture the form and mass of the flowers while also recording the reflective nature of the pewter cup. When I think of pewter, I think of gray, where in reality there are areas that are dark black and others areas that are light blue, pink, yellow, and of course gray. Each time I paint more experience is gained in how to observe and also how to let go, something that I believe is very freeing. This is a painting from my Bountiful Observations series, with 25% of the net proceeds of each sale being donated to the American Horiticultural Society. 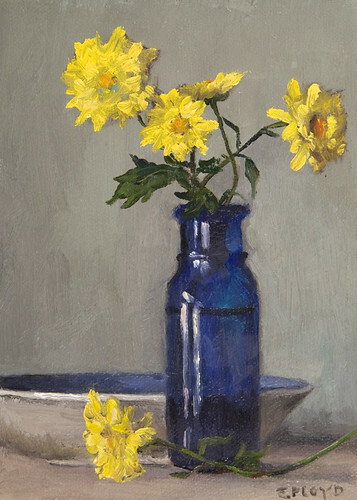 Here is another still life with the yellow mums. When working on this still life I tried to blend my love of exactitude with the freshness of more impressionistic paint handling. While painting I thought about how Fantin-Latour painted chrysanthemums and also a few examples by Claude Monet. They include enough detail that you can discern what type of flower is being painted but they also handle the paint so that their personality is revealed. Also I wanted to share a few photos of my beloved kitty, Slim.